Like most high school seniors, Horn was unsure what she wanted to do when she graduated from high school, but after a helpful suggestion from her government teacher and watching her family’s farrier, Jan Sheets, Horn finally had her ideal job in mind. With her new found direction, Horn immediately went to Wolverine Farrier School, a short length trade school located in Howell, after graduating from Novi high school. Originally, she chose not to go to college because, at age 18, she thought she knew enough. “It’s ironic that I’m still learning some 20 years later”. Right before her graduation from WFS, a representative from Makinac Island Carriage Tours came to the farrier school looking for blacksmiths. She decided to work as a blacksmith for them over the summer but had every intention of returning to Novi. Destiny, it seemed had other plans for her, as she ended up staying on the island for a couple of years. Horn has taken great care to continue her education through several associations that she has been a member of throughout her career. These include the Michigan Horseshoers Association, American Farriers Association, World Championship Blacksmith Organization. American Association of Professional Farriers, and the Michigan Artist Blacksmith’s Association. Through each of these associations she has participated in several clinic presentations and competitions. She is actively a member of AAPF and MHA where she averages three to four educational clinics and contests each year. 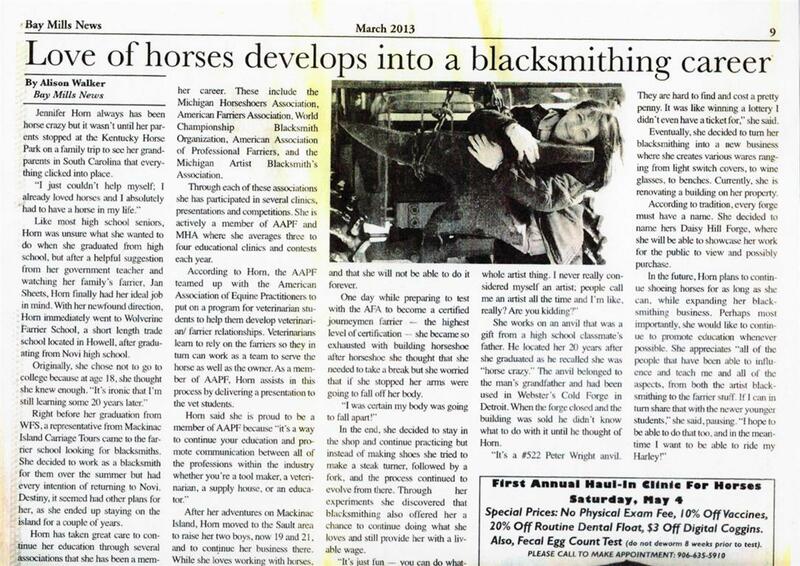 According to Horn the AAPF teamed up with the American Association of Equine Practitioners to put on a program for veterinarian students to help them develop veterinarian-farrier relationships. Veterinarians learn to rely on the farriers so they in turn can work as a team to serve the horse as well as the owner. As a member of AAPF, Horn assists in this process by delivering a presentation to the vet students. After her adventures on Mackinac Island, Horn moved to the Sault area to raise her two boys, now 19 and 21, and to continue her business there. While he loves working with horses, she knows that it is back breaking work and she will not be able to shoe horses forever. In the end, she decided to stay in the shop and continue practicing but instead of making shoes she tried to make a steak turner, followed by a fork, and the process continued to evolve from there. Through her experiments she discovered that blacksmithing also offered her a chance to continue doing what she loves and still provide her with a livable wage. She works on an anvil that was a gift from a high school classmate’s father. He located her 2O years after she graduated as he recalled she was “horse crazy”. The anvil belonged to the man’s grandfather and had been used in Webster’s Cold Forge in Detroit. When the forge closed and the building was sold he didn’t know what to do with it until he thought of Horn. “It’s a 522lb Peter Wright anvil”. “They are hard to find and cost a pretty penny, It was like winning a lottery I didn’t even have a ticket for,” she said. Eventually, she decided to turn her blacksmithing into a new business where she creates various wares ranging from light switch covers, to wine glasses, to benches. Currently, she is renovating a building on her property. According to tradition, every forge must have a name. She decided to name hers Daisy Hill Forge, where she will be able to showcase her work for the public to view and possibly purchase.